Why do we find so many newer homes without the needed kickout flashings when there is such empirical evidence as to their need in protecting the home? This is where the topic gets really interesting because the modern International Residential Code (IRC) does not specify kickout flashings by that name. 1. 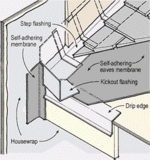 At top of all exterior window and door openings in such a manner as to be leakproof, except that self-flashing windows having a continuous lap of not less than 11/8 inches (28 mm) over the sheathing material around the perimeter of the opening, including corners, do not require additional flashing; jamb flashing may also be omitted when specifically approved by the building official. “At wall and roof intersections“ (mentioned in #6 above)-- that is all they say about where kickout diverter flashings are needed. Surprisingly, they don’t actually name the specific flashing that will resolve the water entry challenge. This is unusual for the IRC. R903.1 General. Roof decks shall be covered with approved roof coverings secured to the building or structure in accordance with the provisions of this chapter. Roof assemblies shall be designed and installed in accordance with this code and the approved manufacturer’s installation instructions such that the roof assembly shall serve to protect the building or structure. This means that the manufacturers of the exterior claddings and roofing materials get to establish the finer details of the needed flashing installations. 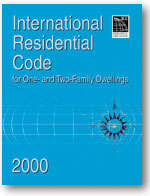 And if they are mandated by the manufacturer, then they are required by the International Residential Code. PLEASE NOTE: Check with your local Authority Having Jurisdiction (AHJ) to determine what is required in your area. The local officials are not supposed to water down the codes and manufacturer’s specs, but they are allowed to require even more stringent standards. Take for instance the cities of Sandy & Draper, Utah. These two neighboring building departments got together and came up with strict flashing details to prevent any further wall failures due to water entry relating to poor flashing and drainage planes. This is a case where the AHJ’s made local requirements that are much stricter than those listed in the International Residential Code.... Kudos to Sandy & Draper, Utah. PLEASE NOTE - TAKE TWO: The only shame is that the cities of Sandy & Draper were not 10 years quicker. That would have saved a lot of grief and expense to those homeowners still suffering great losses on predominantly stucco homes built between 1987 and 1999 when the flashing installations were greatly overlooked. They are now getting better, but mis-installations are still occurring.